As a psychology graduate I am obviously very interested in psychology related readings. I do enjoy reading certain research articles, but mostly I like reading about personal experiences and how psychology “manifests” outside text books filled with theory. Theory can only give you a frame for a certain subject and therefore information is limited. Only when you read about someone’s experience or when you hear someone speaking about what they are going through or what they have been through, is when you can complete your understanding on a specific matter. 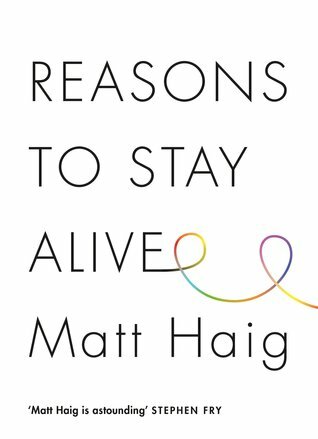 That is why, once I stumbled upon Matt Haig’s “Reasons to stay alive” and found out it is a non-fiction book about his own experience with depression, the book got very tempting and I knew I really had to read it. I have to say it definitely was money well spent. Besides the fact that his writing is very accessible and enjoyable, it is also captivating the way he reveals what he has been through. Without giving away too much, you can also read about the writers’ thoughts, feeling, wishes and how he managed his darker times and also read about personalities who also experienced depression. Matt Haig does a really great job making you imagine how depression and anxiety work and even more, what actually goes through someone’s head when they experience those challenging problems. This is an aspect I find very important for one reason: in life people may confess problems to us, problems that on a personal level we are not exactly familiar with, so saying “I understand what you are going through” can really backfire because they may reply “How can you understand when you did not experience this?” and this kind of exchange can be damaging in terms of your relationship, especially if you are therapist/counselor. So the best way to show your empathy and make them feel a bit better is by saying “I can only imagine what you are going through”. The point here being, this book does a really great job at helping you imagine how depression works beyond any text book. And that is why I think it is a really good book and why I recommend you to read it. Because it will truly help you understand several things better and it will be of great help if you are a therapist or if you have someone close going through what the writer went through or if you yourself are experiencing similar feelings and thoughts, the key being that it will eventually get better. What are your reasons to stay alive?